Bollywood actress Manisha Koirala in white plain Jaypor woven saree with a beautiful border at Rang Rasiya Premiere. Paired with black border and contrast black quarter sleeves with a round neck blouse. 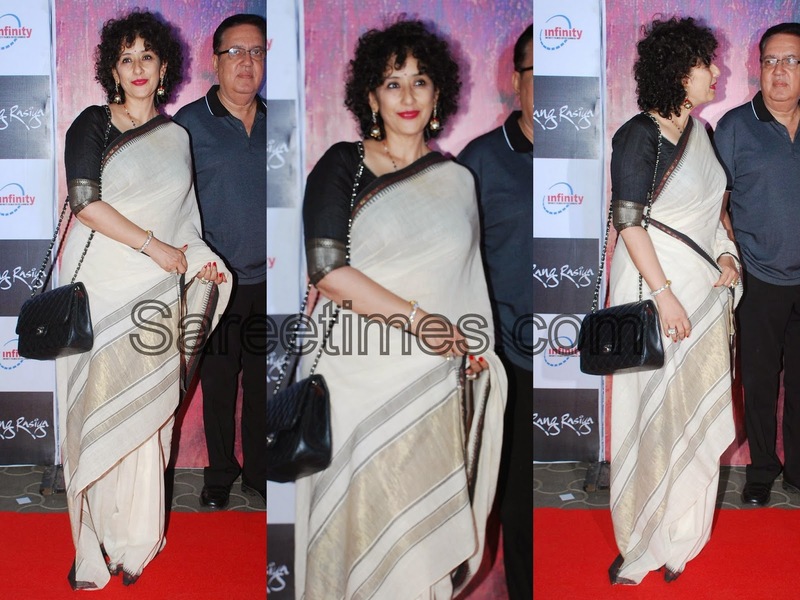 Bollywood actressManisha Koirala in beautiful white designer georgette saree at a movie premier. Silver zari work around it black border. Paired with designer quarter sleeves saree blouse. Bollywood and South Indian actress Manisha Koirala in beautiful white designer saree Vishesh Bhatt’s wedding reception. Gold embellished applique patch work through out border,followed by purple patch work. Paired with maroon designer full sleeves saree blouse with ‘U’ shape neck pattern. Bollywood and South Indian actress Manisha Koirala in beautiful cream designer bridal saree. Designed by Maheka Mirpuri at a charity event held at Taj Hotels, Mumbai. Heavy gold embellished applique patch work all over saree and through out border. Contrast with red designer velvet quarter sleeves saree blouse for back. Applique patch work around the neckline border. Bollywood and South Indian actress Manisha Koirala in beautiful brown designer printed saree with border work paired with designer short sleeves saree blouse. Bollywood and South Indian actress Manisha Koirala in beautiful pink designer embroidery net saree with embellished border work paired with designer embroidered one shoulder saree blouse for back. 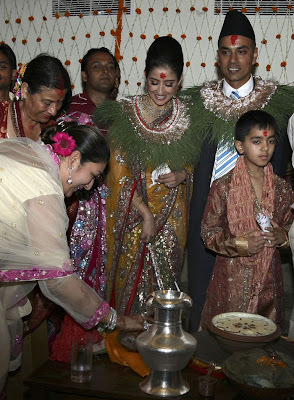 Check out bollywood actress Manisha Koirala on various ocassions of her wedding. Top Right: Yellow color designer saree with golden zari embroidery and patchwork border on her engagement. Bottom Left: Blue color lehenga saree with silver buttie work and patchwork border in silver zari for her reception. Bottom Right : Bright red color bridal saree with floral patchwork border on day2 of her wedding. 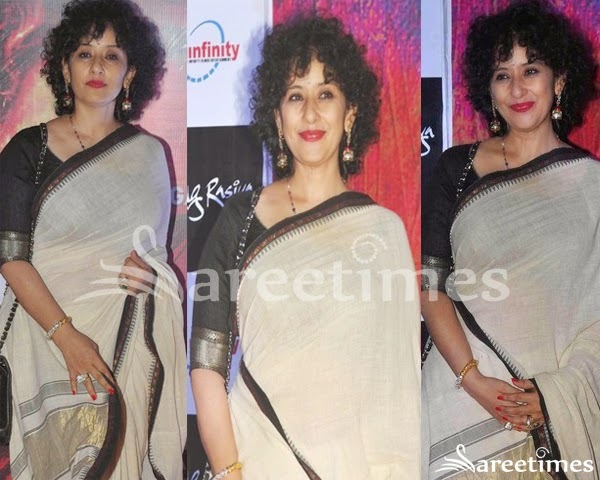 Bollywood and South Indian actress Manisha Koirala in beautiful black designer chanderi silk saree with zari border work paired with designer quarter sleeves saree blouse with round neck pattern. Bollywood and South Indian actress Manisha Koirala in orange saree with gold lace border paired with short sleeves backless blouse. Bollywood actress Manisha Koirala in white floral printed sari paired with cap sleeves sari blouse. Bollywood actress Manisha Koirala in beautiful Mustard and Maroon embellished sari at her wedding. Best Wished for the Couple. Bollywood actress Manisha Koirala in beautiful off white silk saree embellished with gold zari border and paired with U-neck saree blouse. Bollywood actress Manisha Koirala spotted in white cotton saree with multicolour saree border and pallu at Ek Second Jo Zindagi Badal De movie press meet. 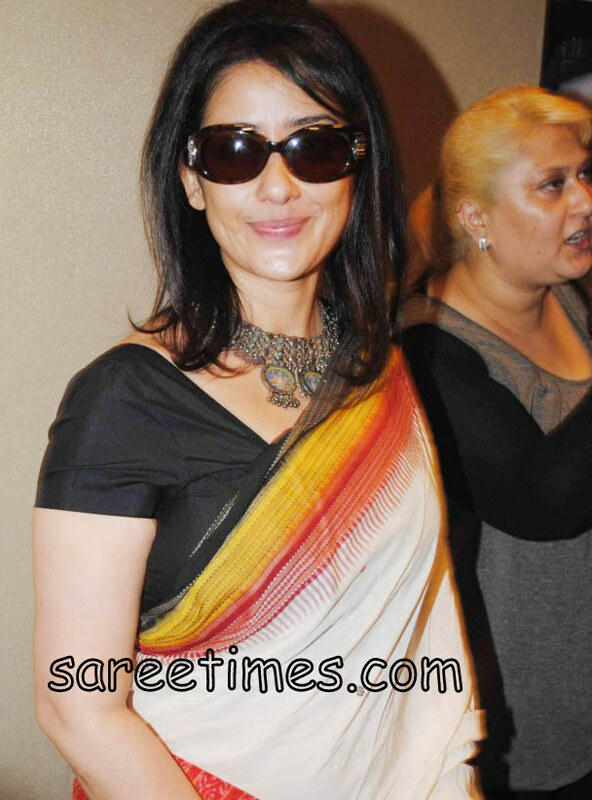 Check out bollywood actress Manisha Koirala in white cotton sari paired with contrast black colour and jewel neck sari blouse.